For most people, having a state-issued ID or driver’s license is not only important for mobility and safety on the road, but is critical to getting health insurance, social services and even cashing paychecks. 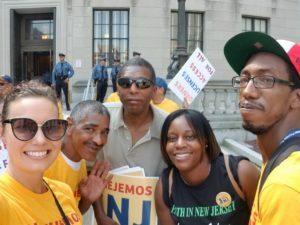 On September 6, three Camden Coalition program participants, accompanied by two of our staff, rallied with residents from across New Jersey in front of the State House in Trenton to show support for a bill expanding access to driver’s licenses to more residents. The Camden Coalition has worked with the Let’s Drive NJ Campaign to share insight and feedback from our care teams about the process of getting identification. Certain documents have been particularly useful to patients who have experienced homelessness, incarceration, or domestic violence. Documents like jail IDs, expired IDs, and notarized letters from homeless shelters could potentially be used to meet new requirements to obtain a state ID or driver’s license. Details of the bill are still being negotiated, but it is in our patients’ best interests to expand the list of acceptable documents. Participating in an event like this was a first for Jamal, Miguel, and Country, who all insisted on being invited to future opportunities to give back. The Camden Coalition’s community engagement team has been working with our care teams to meet patients graduating from the clinical intervention or who have experienced more stability since being housed through Housing First. The effort is intended to create opportunities for patients to stay engaged and help actively transform the systems that impacted their own health journeys. This rally was a space for Jamal, Miguel, and Country to give voice to their experiences in hopes of impacting change where no one is left out of being able to fully participate in our communities. The Camden Coalition would like to extend our deepest gratitude to the community leaders and organizations who have laid the foundation for such an initiative, convened the rally, and continue to organize the Let’s Drive NJ campaign. We look forward to an ongoing partnership to successfully improve our communities’ ability to get critical documentation. You can learn more about the issue and how to get involved here.